Single channel video, 7 minute continuous loop. Installation dimensions variable. 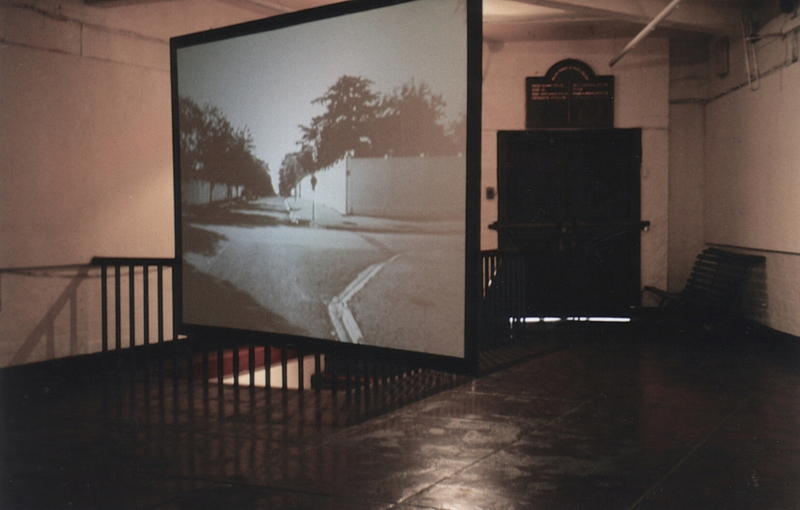 Exhibited at the Market Theatre Galleries, Johannesburg. During a normal weekday my student accomplice and I drove to a regular suburb in Northern Johannesburg. After clandestinely erecting an amplified speaker system, a series of loud, anguished screams were broadcast throughout the neighbourhood. This continued for approximately an hour. Using concealed surveillance cameras we filmed a typical street scene reminiscent of that neighbourhood. Now and again the odd pedestrian would glance in the direction of the sounds, or a vehicle would pass by, the passengers unaware of the performance. For an entire hour the camera rolled unobtrusively. No one appeared or inquired about the distressing screams, nor did security companies or police respond. The northern suburbs of Johannesburg have notoriously high walls built for the purposes of ‘security’. Ironically and evident in this video that security is compromised by the insularity provided by these perimeter walls. The video is essentially a documentation of a performance in which issues of subjectivity and violence are probed and exposed. There are several questions that are inherent in this work. Most significantly, is the distressing realisation that, due to the fear of exposure, no person would come to another individual’s assistance in such an extreme case of violence, had the screams been authentic. It portrays an inadequate Utopia, a society of insecurity. The structure of these suburbs is historically referential; urban environments in South Africa were defined along strictly segregationist boundaries during the Apartheid era. These suburbs are highly emotive landscapes associated with white middle class affluence. Inherent to those values, is an identity of safety.